Nursing is an intellectual and practical science that is far reaching to influence all aspects of the whole person. Nursing operates through a framework, known as the nursing process, to problem solve and plan individualized patient care. Although the registered nurse is responsible for the development and direction of the nursing process, the practical nurse is competent in a body of knowledge and skill to effectively assist in the provision of patient care services. Cambridge Institute of Allied Health & Technology offers a nursing curriculum that is reflective of the nursing process. The curriculum entails a total of 1,350 contact hours, 675 in nursing theory and 675 in clinical practice. The student learns how to plan & patient cares, manage patient safety & infection control, promote health & wellness, and perform skills relevant to the physiological & psychosocial integrity of the whole person. The program establishes the student in a goal directed process that is strategic and systematic to determine patient priorities, needs and concerns. The study subjects include anatomy and physiology, pharmacology, nursing fundamentals, medical surgical nursing, nutrition, mental health, maternity and pediatrics. The curriculum will emphasize critical thinking, technology and leadership to develop measures for problem solving within the context of evidence based nursing. Additional topics such as nursing ethics & law, death & dying, culture, spirituality, Maslow hierarchy of needs, growth and development and therapeutic communication are critical to the learning process. Request more information or schedule an appointment today. This course is designed to provide the foundation and knowledge of the human body. Emphasis is placed upon normal structure and function so that the abnormal conditions will be better understood. Topics include introduction to medical terminology and the study of life to include the human cell, tissue, organs and body parts that relates to the different body systems such as the musculoskeletal, blood, cardiovascular, lymphatic, respiratory, digestive, sensory, endocrine, nervous, urinary and the reproductive. The student will become familiar with the different types of cells, DNA, genetics, heredity and chemistry as well as body regions, directions and positioning. This course is designed to enhance the student’s knowledge and skill in basic mathematics relevant to health care. The course includes numbers, fractions, decimals, ratios and whole numbers. The metric, apothecary and household conversion systems will be presented. The course is designed to enhance the student’s ability to calculate drugs safely and effectively. This course is a study of human growth and development. The student will become familiar with the appropriate terminology related to growth and development. Life span will be presented in ten (10) stages to emphasis the developmental changes and expectations from infancy through older adulthood. Various developmental theories established by Freud, Erikson, Havinghurst and Piaget will be explored. In addition, the student will become familiar with the significance of cultural considerations, stress & adaptation, death & dying issues such as loss, grief and death. The role of the practical nurse will be discussed as each phase of growth and development is presented. This course is designed to introduce the student to basic fundamentals of nursing knowledge and skills that relates to the historical view of nursing, legal and ethical responsibilities, the health care environment and basic procedures. It serves as a foundation to the physiological and psychosocial integrity of the individual. Topics include OSHA, HIPAA, HIV/AIDS, CPR and domestic violence. In addition, the role of the practical nurse will be discussed in relation to the nursing process, documentation, client teaching, safety and health & wellness. This course will re-introduce the student to Maslow theory and the nursing process. The student will have hands on experience in a nursing laboratory to complete nursing procedures and better understand the rationale associated with the procedures. The student will complete a minimum 20 hours in the nursing lab and a minimum of 20 hours in a nursing facility. In completion of this course, the student will meet the requirements of a nursing assistant and home health aide as well as demonstrate competencies to advance in the practical nursing program. This is designed to give a better understanding of the importance of both written and verbal communication in the nursing process. Students will learn the foundations of communications including public presentations and interviewing skills. Student will also learn grammar, punctuation and usage skills that are useful in everyday language. This course builds on Fundamentals of Nursing Theory I. The course is designed to develop the student’s knowledge and skills in intermediate and advanced nursing skills. 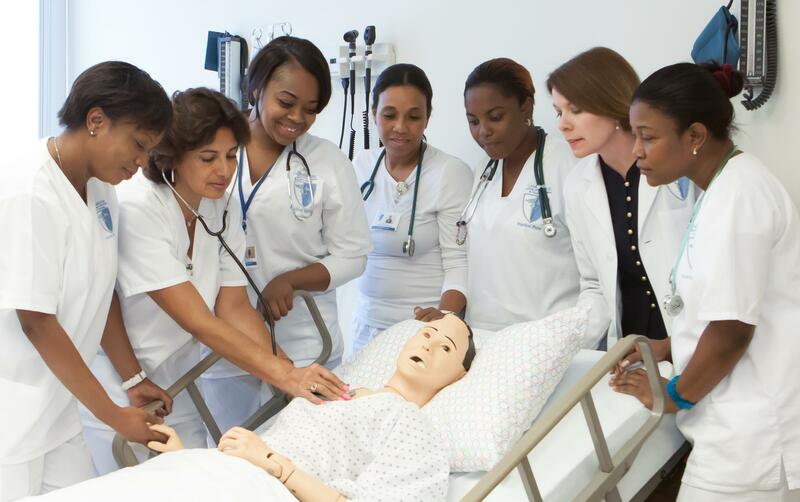 This course prepares the student to progress in the practical nursing program as well as develop readiness for courses such as pharmacology and medical surgical nursing. This course is designed to develop the student’s knowledge and skills in pharmacology. Major medication classifications and their effect on the body system will be presented. Topics include sedatives, hypnotics, antimicrobials, cholinergic drugs, adrenergic blocking drugs, peripheral dilating drugs, thrombolytic agents and substance abuse and pain management. The role of the practical nurse will be discussed throughout the course in promoting safety in medication administration. The course is designed to introduce the student to the role of the practical nurse for the nursing care of the adult patient within medical surgical settings. The student will develop an understanding of the physiological integrity as it relates to the nursing process. The course comprises an introduction to disorders & diseases and the application of safety measures, pharmacology and nutrition. The study will cover the body systems such as the cardiovascular, immune, respiratory, digestive, urinary, neurological, sensory, endocrine, integumentary and reproductive. Based on this study, nursing principles, processes and care plans will be integrated. Students must successfully complete Medical Surgical Theory & Clinical I before progressing to Medical Surgical Nursing II Theory & Clinical and Theory/Clinical III. Students must achieve a passing grade in both theory and clinical. Medical Surgical Clinical is a rotation in a hospital and skilled nursing home setting to provide the student with hands on experience in the care of the adult patient. This course is designed to introduce basic concepts of mental health. Topics include relationship development, different disorders, drug therapy and management of patients with various emotional and mental disorders such as anger, stress, neglect & abuse & nutritional imbalances. This course is designed to help the student gain a better understanding of the older adult. The knowledge and skills learned will develop the student in the special care needs of the geriatric patient. The theoretical component will prepare the student for clinical experiences in a nursing facility, hospital and/or community setting. The course will focus on aspects of the aging process and the older patient challenges in loss, safety, mobility, drug therapy, nutrition, activities of daily living, exercise, to name a few. The student will engage various case studies & clinical experiences to build his or her understanding of the psychological and physiological integrity of the older adult. This course is designed to help the student gain experience in the nursing care of the childbearing client. The student will study the aspects of maternity nursing such as prenatal care, complications of pregnancy, birth process, postpartum and newborn care. The knowledge and skills acquired will be the focus of the clinical. The student will continue to reinforce health promotion by focusing on client readiness, nutrition, use of substances, drug therapy, stress, abuse, imaging, psychosocial & cultural influences on the childbearing client. This course is designed to help the student gain experience in basic pediatric care. The study will cover topics related to common problems in pediatrics for ages 1 – 18 years as well as children with special needs. The student will study pediatric nursing from the psychosocial and physiological aspects. A review of the life cycle, family & cultural considerations, nutrition, abuse, safety & wellness concepts will enhance the student’s understanding of the pediatric patient. In addition, the course will assist the student use the nursing process in caring for the patient. The knowledge and skills acquired will be the focus of the clinical.